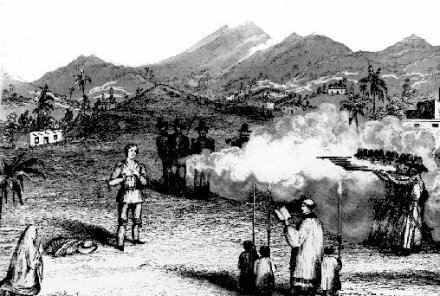 On this date in 1843, a Mexican firing squad disposed of Texan commander Ewen Cameron. High praise indeed: but his end would better resemble Wallace. Cameron hitched on to the ill-fated Mier Expedition plundering raid over the border. The verdict refused by Fortune was reinstated by the hands of men. Abrasive characters like the Bruce are not so well appreciated across their respective frontiers, and Cameron had built some ill-will in the Mexican army with his intrepidity the previous year. The officer thereby embarrassed, Antonio Canales, was loath to let this reviled prisoner escape his clutches, and urgently petitioned Santa Anna to dispose of him. This was duly done at Perote Prison, where the other lottery survivors languished for months or years along with other captives of various Mexican-Texan skirmishes. Cameron County, Texas (the state’s southernmost) is named for Ewen. * According to this account, the Mexicans loaded the fatal black beans onto the top layers in an effort to get the officers (who drew first) to pick them. Cameron was wise to the scheme, and foiled it by thrusting his hand all the way into the pot.